Growing things is a passion of mine and over the years I’ve found that some things are just more enjoyable to grow than others. 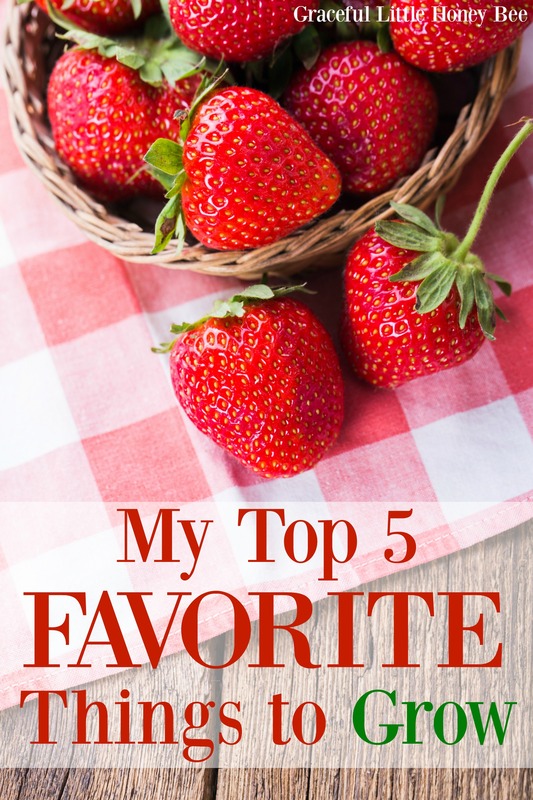 Of course my list will look different from someone else’s list, but today I’m going to share with you my top 5 favorite things to grow. Mostly, because we love to eat them and they are so darn tasty. Enjoy! Root crops are fun to grow because of the anticipation factor. You throw a chunk of potato in the ground and don’t know what kind of crop you’ll get until you dig them up at harvest time. I love growing potatoes because they’re easy, we eat a lot of them and also you get to plant them pretty early in the season. Around here we plant potatoes on St. Patrick’s Day and dig them up on the 4th of July. If you plan things right you can plant a second crop midsummer to harvest in the fall. Sweet potatoes are another fun root crop that I grow every year. They do best in warm climates because they have such a long growing season. I love how they vine out all over the place and have pretty purple flowers. Some people have told me that they even plant them in their flower beds as a ground cover. I’ve found them to be extremely easy to grow as long as you get them in the ground on time. I plant mine in mid May and then harvest them in mid October right around or after our first frost of the season. Also, they enjoy sandy soil. Like most gardeners, tomatoes are what started it all for me. You simply can’t compare the taste of homegrown tomatoes to store-bought. I also love how versatile they are in the kitchen. At our old property we had an Arkansas Black Apple tree that produced TONS of apples. We also had blueberries, strawberries and raspberries. We’ve already planted two apples trees, two blueberry bushes and several strawberry plants at our new property and I can’t wait until we have fresh, homegrown fruit again. I’ve also grown watermelon in the past, but I’ve found that my family doesn’t really eat enough of it to justify growing it. I may have to try it in again in the future. I absolutely ADORE growing flowers. The only problem is that I’m not very good at it. The one flower that I can grow consistently are sunflowers. I’ve found them to be really easy and they look wonderful in the garden. Also, they attract tons of pollinators and give the birds a snack at harvest time. I really am going to work on growing more flowers because nothing beats a homegrown bouquet on the kitchen table. What do you enjoy growing the most and why? I’d love to know! I love to grow yellow squash and cucumbers! They is easy to grow! I will have to try the sweet potatoes! My grandmother would keep sweet potato vines in a vase of water and keep it on her window sill as a flower. I have also seen some pinterest ideas with planting the sweet potato vines in planters for a beautiful patio plant. I love growing sweet potatoes! We have never been able to grow potatoes and we love them! but I'm hoping we will be more successful at our new property. I can't wait to grow fruit too! Happy spring planting! Peppers, green beans, cucumbers, potatoes and sweet potatoes are my five favorite vegetables. Peppers, green beans and cucumbers are very easy to grow from seed. I do start my peppers in the house a few weeks ahead of time. I too love the excitement of digging up potatoes. I've grow regular potatoes many years but last year was the first time for sweet potatoes. I had a very nice harvest and will continue to enjoy eating them for a few more weeks. Zinnia, marigold, morning glory, 4 o'clock and sunflower would be my favorite flowers.The first four pretty much reseed themselves, though I do save seeds each year and pretty much just throw handfuls around the yard. Sunflowers tend to take a little more planning and work but seeing those huge plants grow from a simple little seed is amazing.